European and Latin American leaders will gather Thursday in the Uruguayan capital of Montevideo to discuss plan to solve the deepening political situation in Venezuela, but will steer clear of direct intervention. The latest conflagration of tensions erupted when Juan Guaido, a lawmaker from Venezuela's National Assembly, a legislative body held in judicial contempt by the Supreme Court since 2016, illegally declared himself interim president on Jan.10. Edison Cavani has joined teammate Luis Suarez in scoring in three consecutive World Cups with his strike in a 3-0 win against Russia. The strike duo are the only Uruguayans in history to achieve the feat. Cavani grabbed the third and final goal of Uruguay's 3-0 thrashing of hosts Russia in Samara as the team recorded three wins from three group games, and advanced to the knockout stage in first place. They will now play in Sochi against the runners-up of Group B in the last 16. Russia, who had already qualified from the group stage for the first time in their history, will return to Moscow and their home Luzhniki Stadium, for the knockout stage against the Group B winners. It was Suarez who opened the scoring at Samara Arena with a free-kick within 10 minutes with a low strike that benefited from some questionable defending from veteran center back Sergei Ignashevich. Denis Cheryshev then scored an unfortunate own goal when a shot cannoned off his outstretched leg and into the net, giving Igor Akinfeev, who had already set his feet to dive for the ball, no chance. 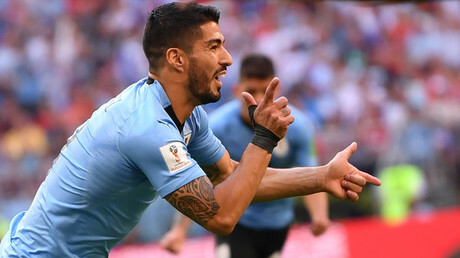 With their win over Russia, two-time World Cup winners Uruguay became the first team to win all three consecutive games since Argentina at France '98. "They can hold your body, but not your heart," former Uruguayan President Jose 'Pepe' Mujica told the crowds of Lula supporters in Curitiba. Luiz Inacio Lula da Silva is "in good spirits" despite his incarceration on corruption charges, says former Uruguayan President Jose 'Pepe' Mujica, who has visited the Brazilian presidential candidate in his detention center and delivered a message of encouragement to supporters. Mujica met with Lula's followers on Thursday outside the Federal Police headquarters in Curitiba, where they have been camped out since the Workers' Party (PT) representative was taken into custody April 7 on corruption allegations. The former Uruguayan leader praised the achievements realized during Lula's administration, as well as his international endeavors within Latin America. "Under Lula, Brazil behaved like an older brother," Mujica said, adding that he found the candidate "in good spirits" but was worried for the future of Brazil and Latin America as a whole. Mujica said Uruguay is concerned about the coming elections and Lula's fate. "For a small country flanked by gigantic Argentina and Brazil, when a neighbor shuts us out, we – Uruguayans – will catch a cold." Earlier Thursday, Mujica transmitted a live video via social media addressed to Lula's supporters: "They can hold your body, but not your heart." "There is a slogan there that says 'Lula Libre' (Free Lula); really, the mind can never be imprisoned. They can imprison your body, but not your heart, your mind. For whatever purpose, your mind is your heart, to go on beating for the control of Brazil... For this reason, Lula is free. "This long fight didn't begin with you or us and it will not end with our lives… It's a shame that it almost takes a miracle to serve one''s country faithfully, but it is our fight." Lula's 12-year prison sentence is widely viewed as a political stunt by the ruling right-wing government to block Lula from running for re-election. The 72-year-old leftist politician insists he is innocent. Despite being incarcerated, Lula remains ahead in the presidential polls for Brazil's October presidential election. The PT has repeatedly said they will register Lula as their official candidate come August. Environment, renewable energy sources, sustainable and local development, the use of new technologies, tourism, industry, studies of Medicine, curricula, didactics, the role of university in different contexts, all of these subjects were discussed in the 11th International Congress of Higher Education Universidad 2018 — event that marked the 100th anniversary of the Argentine University Reform. University 2018 gathered more than 2,000 delegated from 60 nations. Without ignoring handicaps and obstacles, the truth is that our country can boast realities that are still yearnings for other countries of the world. In this regard, following the 2030 Agenda and the UN Sustainable Development Goals (UN, 2015), the Minister pointed out: “we are in a better position to fulfill them” and noted that Cuba is working hard to meet these goals as soon as possible. As he stressed in the opening ceremony speech: “The advance of the 2030 Agenda of Sustainable Development is imperative for the world as nations are trying to counteract the current unsustainable model of development—discriminatory, hegemonic, and predatory. There have been many changes in Cuba’s Higher Education from the Triumph of the Revolution to the present days, always aiming at improving the quality and access to Universities in Cuba. In this regard, almost 1.5 million professionals have graduated from 1959 to present days. Therefore, 12% of the population and 22% of workers in Cuba has university level. The remarkable growth of its institutions is another achievement. Cuba boasts today 50 universities all around the country compared to the 3 universities that existed back then (in Havana, Las Villas, and the Eastern side of Cuba). The system also includes 126 university centers in municipalities. Destined to experience a continuous development process, the Higher Education in Cuba advances on the basis of an inclusive process, which has certainly brought positive results concerning material resources and financial savings as well as a better use of the workforce in universities, especially in the field of teaching. The process that has been implemented since 2011 to updating Cuba’s economic and social model has demanded the accompaniment of the Higher Education as well. Thus, new policies have been approved. The critical nature and dissatisfaction of Cuban citizens lead us to believe we are the only nation in the world suffering from a certain ill. However, this Congress allowed us not only to reflect on extremely serious problems affecting many countries in the region, but also to become aware of the right path of the policies undertaken by the Cuban State in order to overcome obstacles and certain quality index. The testimonies of several foreign participants showed Higher Education is not going well and therefore, there is no positive sign in General Education (263 million students were not enrolled in schools as of 2014). Uruguayan professor Fernando Rodal Mc Lean —President of the American Federation of Teachers— spoke in one of the panels about the need to “fight” against universities that limit enrollment. He also criticized that students, in order to access higher education, have to go into great debts. Hence, it is important to reach that free, inclusive education and teachers can enjoy a decent job. A moving situation was narrated by Salvadorians Monica Fernandez Rubio (Spanish woman naturalized citizen of El Salvador) and Sabas Clavel Fuentes, who showed the situations of young people in that country where just the 8% of the population have access to universities. In rural areas, this number barely represents 2%. The next Congress will take place on February 10-14, 2020. A lot will happen from now on. Nonetheless, Cuba will surely present new experiences, contributions, and impacts. The Brazilian film "João, O Maestro,'' by Mauro Lima, inaugurates today the 21st edition of Punta del Este International Film Festival, in Uruguay, where over 50 national and foreign films will be screened. With the award for the career of filmmaker Silvio Caiozzi in the Sala Cantegril, this film festival will begin, which will run until February 25. The festival, considered the most important of its kind in the country and among the best in South America, will show productions from the region and Spain, as well as proposals from Japan, South Korea, Palestine and the independent cinema of the United States, among other nations. In addition to the world cinema productions, 12 films will be in the Ibero-American Competition and for the first time 'Maldonado Filma' will be presented, according to the schedule announced by the organizing committee. This initiative will show a dozen audiovisuals made in the homonymous department of the southeast of the country that were chosen by the Audiovisual Incentive Fund of the Municipality and were finalists in the 48th Film Festival. The Filmusic Fest, in its third edition, will display productions about the lives of music personalities, which include films such as Vinicius, Yo Sandro y Chavela this year. As in previous days, the Festival of Punta del Este will deliver the 'Mauricio Litman' awards in the categories of Best Film, Best Director, Best Actress, Best Actor and Audience Award. The festival of celluloid will reach other cities in the territory such as Piriapolis and Aigua, among others, the organizing authorities said. Argentine actor Miguel Angel Sola will be one of the guests of a week film event and will present the film "El último traje." This event has the support of the Ministry of Tourism and is linked to other festivals such as Rio de Janeiro, Florianopolis, Rosario, Gramado, and is part of the strategy for the development of the audiovisual industry in Uruguay. Mujica was called "the world's poorest president" by his followers. Former President Jose "Pepe" Mujica, who governed Uruguay from 2010 to 2015, warned Monday of the possibility of global trade wars erupting. "The Uruguayan government must deal with an international situation full of uncertainties, and we don't know whether this situation will lead to a trade war. Hopefully not, but it's a latent danger," Mujica said after a meeting of his Broad Front coalition. The 81-year-old former president of Uruguay, who has been involved in politics his whole life, has previously said he thinks U.S. President Donald Trump has “powerful enemies” and won't be around for long.